Watch our favourite Eurovision 2013 performances! Every year the world has to cope with a sequin shortage because of the Eurovision Song Contest. In return we do get a lot of hilarious songs, dancing we didn’t think a human could do and some of the worst TV presenting ever. The Eurovision Song Contest is a competition to find the best song in Europe but real bands like One Direction and The Wanted aren’t allowed to enter. It’s for amateurs who are less well known like Cezar, ByeAlex and Blue. Here’s some of our favourite performances from the night. Weirdest thing you’ve ever seen? Yeah, we know. The extending dress looks quite fun though. 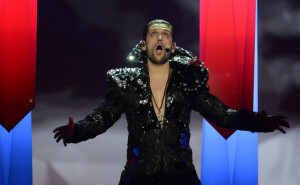 Did you watch the Eurovision Song Contest? What song was your favourite? Let us know in the comment box below please. Oh, and the UK came 19th by the way. Remember, you can listen to all the good bands from the UK like Little Mix and Lawson by tuning in to Fun Kids on DAB Digital Radio in London and online across the UK! Click here to listen!